Harlow and I were recently asked by the UK's largest distributors of Board Games and Collectables, Esdevium Games Ltd, if we would like to review any of the toys from the Fisher-Price Classic range in their collection and since Harlow is a massive fan of dogs I chose a Little Snoopy for her to enjoy. We do love Fisher-Price toys in our house and have quite a few for the kids to play with. If you'll remember a few years back, when Logan was a baby, I did a review of the lovely Fisher-Price Chatter Telephone for Esdevium Games Ltd and it's still going strong to this day. Harlow loves it! Here's a quick bit of history behind the Fisher-Price brand: "In 1930, Fisher-Price set standards for each of their toys that are still in place today. These standards included: intrinsic play value, ingenuity, strong construction, good value and action. The goal was to create toys that appealed to a child's imagination and encouraged interactive play. Toys that satisfied the natural interests of each age level and that looked, acted as toys should. Toys that combined whimsy, action, sound, and that made growing up a delightful experience." 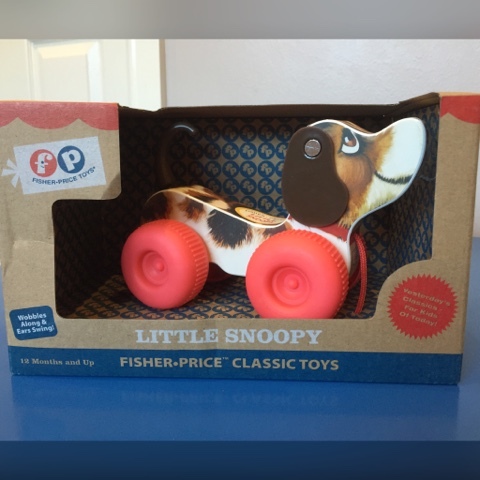 Fisher-Price have been in the toy game for such a long time and they make such fab products and of course I think that the Classic Little Snoopy is one of them. Originally introduced in 1966 Little Snoopy wobbles along when pulled by his red cord. His little bum moves up and down and his tail swishes from side to side. His ears move back and forwards with the movement and he makes quite the nose when on the go. 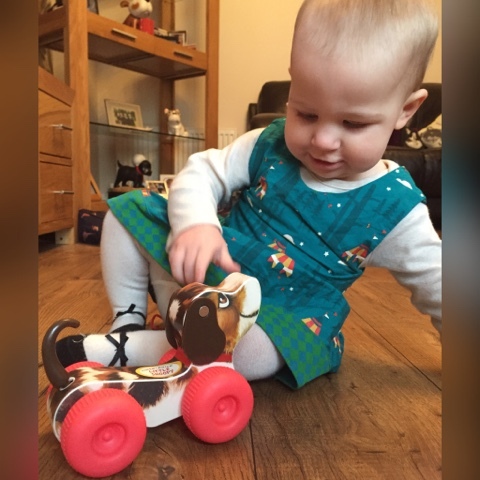 Harlow loves her new little friend, he's robust as she drops him often and even though he can be quite noisy when being pulled along she thinks this is hilarious and it definitely gets her attention. Little Snoopy is a simple toy and often these can be the best as they let children's imaginations run wild. Harlow does love to have him tagging along at the back of her however the red cord for pulling is a bit on the short side so he ends up swinging in mid air unless she's sitting on the ground. Her favourite thing though is playing with his ears, the swinging motion of them moving back and forward has her entranced. Little Snoopy is priced at £14.99 and can be found for sale on Amazon. I'm sure with a little searching though you'd be able to find him cheaper in a few different shops. 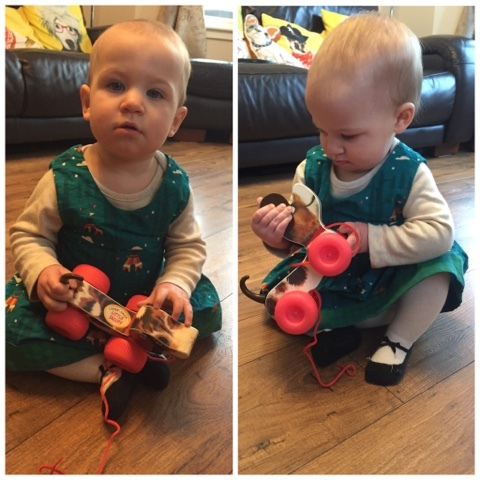 Overall Harlow is really happy with her toy and has had tons of enjoyment from him. I've often found myself picking him out from the toy box and giving him a whirl around the living room just to watch her reaction, she loves it of course and comes rushing over to steal Little Snoopy from me. He's a lovely little classic toy. Please visit www.esdeviumgames.com for more products and information. 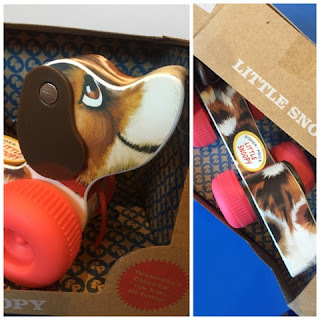 Harlow was provided with her very own Classic Little Snoopy toy in return for an honest review. 0 comments on "Review: Fisher-Price Little Snoopy"